When Germany invaded the Isle of Sark—the last foothold of feudalism in the western world—Dame Sibyl Hathaway protected her people with the unlikeliest of weapons: Feudal etiquette, old-world manners, and a dollop of classic snobbery. Dame Sibyl Hathaway had 275 Nazi prisoners on her hands and knew exactly what she wanted to do with them. It was May 1945. Five years earlier, Germany had invaded Hathaway’s home in the British Channel Islands, a tiny isle of 400 called Sark. Despite having no modern defense network or fancy gun emplacements—it didn’t even have electricity—Sark had proven itself to be uniquely prepared for its unwelcome visitors. The island had an advantage that the rest of Europe had discarded centuries earlier: feudalism. The Isle of Sark was the western world’s last fief. For 400 years, it had faithfully followed 16th century Norman law, and 61-year-old Dame Sibyl (as her subjects called her) served as their feudal overlord. She once defended the institution of feudalism by saying, “What is good enough for William the Conqueror is good enough for us." 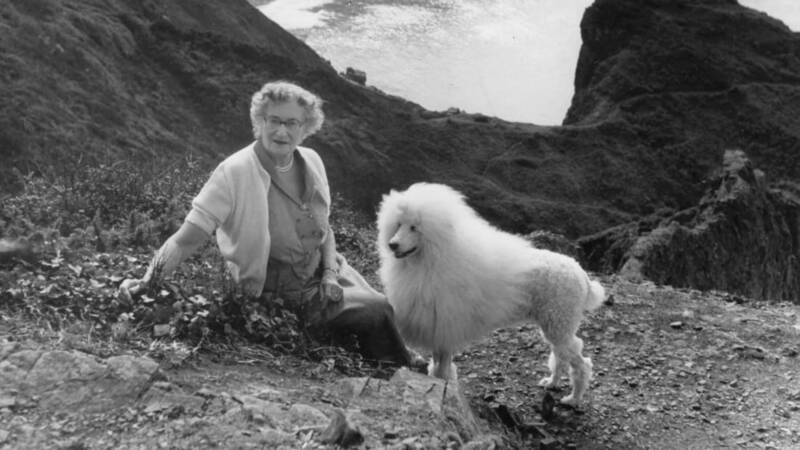 Now, just one week after Hitler had killed himself, Dame Sibyl walked down a steep, dusty path toward Sark’s main harbor to meet the British “liberation.” Around her, the island’s meadows appeared to bloom in celebration. The Dame greeted a group of British soldiers and led them to the Nazi’s island headquarters to discuss the terms of surrender. As Lieutenant Colonel K. Allen questioned the German Kommandant, Dame Sibyl translated everything into German. When Allen finished his interrogation, he turned to the Dame. With that, the liberation team departed and Dame Sybil regained control over not just her island, but a new legion of German vassals. You could argue that she had been controlling them the whole time. Perched 350 feet above the English Channel, the island is a precipitous tableland blanketed by rolling pastures and a kaleidoscope of wildflowers. Narrow dirt lanes, walled in by tall hedgerows, sit shaded under the tunneled canopies of trees. On a clear day, you can peer across the island, past teams of grazing sheep and Guernsey cattle, and look onto a watery horizon that melts into the sky. The place is a time capsule. Cars are banned. Residents get around by bicycle, and the local ambulance and fire trucks are pulled by tractors. With little noise pollution, the island’s soundscape is a symphony of coastal winds, crashing waves, the clip-clop of horse-drawn carriages, and the rustle of waving fields bursting with whimsically named flowers: foxgloves, toadflax, dog violets, and oxeye daisies. Since there are no streetlights on Sark, the Milky Way gleams on moonless nights. Along Sark’s coast, farmland cedes to golden slopes of gorse, which flirt with balding cliffs that tumble hundreds of feet into churning turquoise seas. Along the shoals, clouds of gulls scream, purple jellyfish bob, and the occasional puffin waddles. The island is tiny—only three miles long and 1.5 miles wide—but has so many nooks and crannies that it boasts 42 miles of coastline. When the strong tidal stream recedes, a wonderland of anemone-filled coves and caves is revealed. People have lived on this tranquil island as far back as 2000 BCE. Legend has it that, in the 6th century, Saint Magloire brought religion to Sark while riding the back of a sea monster. In the 13th century, the island became the property of the English Crown but remained mostly deserted (with the exception of a few "pirates, thieves, brigands, murderers, and assassins," François Rabelais wrote in the 1530s). In 1565, Helier de Carteret cleaned up the place after he earned Queen Elizabeth I’s permission to establish a fief there, bringing 40 families—most of them from the nearby island of Jersey. Each family received a parcel of land, called a tenement, and to this day Sark's plots bear old names in Norman French: La Varouque, La Sablonnerie, La Moinerie. Culturally and politically, Sark has changed very little since then. It, along with the three other major British Channel Islands—Guernsey, Jersey, and Alderney—are possessions of the British Crown, yet each island remains politically independent of the United Kingdom. (On Sark, there is no income tax, no welfare, and no help from the National Health Service.) During Dame Sibyl’s lifetime, homes were lit with oil lamps and water had to be pumped from a well or catchment. Anybody who wanted a warm bath had to light a fire by their tub. And most residents spoke a unique patois called Serquais, a remnant of the Norman French brought there by the island’s original settlers. When Germany invaded in 1940, many of the descendants of those original 40 settlers still lived on Sark. Heirs to more than four centuries of feudal rule, they had no intention of abandoning their island or their way of life. This was especially true of Dame Sibyl, who had been groomed to become the island’s leader since she was a little girl. As it turned out, the strict feudal etiquette she had spent her life practicing would become a potent weapon, a tool for bending the occupiers to her will. On the morning of June 9, 1940, Dame Sibyl Hathaway looked across her island and saw the horizon obscured by billows of black smoke. Twenty-five miles east, on the coast of France, oil storage tanks spewed flames. Weeks earlier, the Wehrmacht had penetrated the Maginot line, the bulwark of trenches and fortifications separating France from Germany. Now, as the occupation of France looked inevitable, the people of Normandy were sabotaging their own oil reserves. For Dame Sibyl, it was a private smoke signal. If Normandy fell, Sark would follow. (She knew the Germans would be hungry to occupy the Channel Islands; it was a chance to sow propaganda about controlling “British” territory.) As rumors swirled about evacuations, Dame Sibyl took the ferry to Guernsey to see how the second biggest Channel Island was preparing. The air was thick with panic. There were lines everywhere: Lines at stores as people frantically bought suitcases, lines at the bank as people attempted to withdraw money, lines at the dock as people pushed onto boats bound for England. Possessed by the chaos, islanders buried heirlooms in their gardens. Hundreds of expectant evacuees swarmed the veterinary clinic in an attempt to put their beloved pets to sleep. But Dame Sibyl worried that Sark could crumble if too many people evacuated the island. The gist of feudalism, after all, is that it's self-sufficient: If everybody on Sark stuck together, the Dame reasoned, life could go on. Shortly after returning from Guernsey, she called a meeting and told the inhabitants that she had decided to stay—and asked the islanders to remain as well. The Dame understood that not everybody might sign on and promised to arrange for anybody's departure, if they so wished. Of those born on Sark, not one person left. Just one week after the Channel Islands were officially demilitarized, three German military planes barreled over Sark, hurtled toward Guernsey, and bombed that island's capital of St. Peter Port. Thirty-eight civilians died. Dame Sibyl watched as the planes arced over the Channel and aimed for her home. Bullets pelted Sark's harbors, but nobody was hurt. The following day, the telephone line connecting Sark and Guernsey fell silent. Three days after that, on July 3, 1940, a lifeboat arrived at Sark’s main harbor. The Germans had arrived—and the Dame made her first move in a subtle game of political one-upmanship. Sark’s coastline is foreboding. In the Middle Ages, pirates and privateers would circle the island's bluffs looking for a place to dock, only to declare it unreachable. Today, visitors can be carried up a steep lane by a tractor-pulled wagon affectionately named the “Toast Rack.” In Dame Sibyl’s day, horses lugged the passengers up. But not on the day the Nazis arrived. Dame Sibyl resolved that she would not go to meet the Germans; they would come to her—and they would walk. As the Nazi officers hiked, Dame Sibyl waited in her royal residence, a stone mansion known as La Seigneurie, and talked strategy with her husband, Bob. “Let’s take a leaf out of Mussolini's book,” she told him. They placed two chairs behind a desk at the far end of the drawing room, which would force the officers to walk the whole length of the room. It was a small power move, but they needed every trick they could muster. The Dame advised her maid to announce the Germans as if they were any other villager. When the Germans arrived, the officers wiped their boots on the doormat outside. Dame Sibyl glanced at her husband with relief. Just from the sound of their feet, she could tell that the men about to enter her house were aristocrats—the way they wiped their boots was a sign of respect. As luck would have it, the Channel Islands attracted a disproportionate number of Germany’s uniformed aristocrats. The islands were a relatively safe spot for Germany’s most privileged soldiers, who were naturally attracted to staying in a bygone place where inheritance still equaled influence. “That the German nobles would have felt a particular affinity with a place where pre-modern feudal rule was still partially intact is an inescapable conclusion,” Paul Sanders wrote in The British Channel Islands Under German Occupation. This arrangement, however, would play into Dame Sibyl’s hands. The maid announced the men’s arrival. Two officers, draped in dark green, introduced themselves and told Dame Sibyl that they had come to establish some rules. There would be a curfew at 11 p.m.; no groups larger than five were allowed in the streets; all pubs were to be closed; all arms were to be confiscated; and no boats were allowed to leave the harbor. Hearing this, Dame Sibyl nodded: Bitte hinsetzen, she said, asking them to sit. She continued speaking in German: "I will see that these orders are obeyed." There was a moment of stunned silence. The German officers, dumbfounded by the Dame’s command of their language, were immediately flustered. “You do not appear to be in the least afraid,” one officer said. This, after all, was her island. For the past 400 years, the Isle of Sark had been ruled by a "Lord of the Manor" called a Seigneur or Dame, who pledges allegiance to, and rents the island from, the King or Queen of England. The Seigneur or Dame holds the island in perpetual fief, and rents out 40 parcels, or tenements, to 40 different residents called tenants, who can rent pieces of each parcel to lower-ranked islanders. For centuries, these 40 landowners made up the island’s parliament, called Chief Pleas, with the Seigneur or Dame presiding as a quasi-dictator. "It may seem undemocratic that most members hold their seats by right of property," Deputy John La Trobe Bateman told National Geographic in 1971, "but we are perhaps the world's best-represented community. With our population of 575, we have one legislator for every 11 people." "All of its rights, members, liberties and appurtenances, and all and singular castles, fortresses, houses, buildings, structures ruined with their fragments, lands, meadows, pastures, commons, wastes, woods, waters watercourses, ponds, fees, rents reversions, services ... vicarages, chapels or churches, and also all manner of tithes, oblations, fruits, inventions, mines, quarries, ports, shores, rocks, wrecks of the sea, shipwrecks, farms, fee farms, knight’s fees, wards, marriages ... fugitives or pirates, or felons de se, out-laws, of persons put exigent, and the forfeited or confiscated goods of persons condemned or convinced any other way whatsoever; also all forfeitures, paunages, free warrens, courts leet, views of frankpledge, assize and assay of bread, wine and beer; all fairs, markets, customs, rights of tolls, jurisdictions, liberties, immunities, exemptions, franchises, privileges, commodities, profits, emoluments, and all of the Queen’s heredits..."
And none of that counted the specific privileges afforded to Dame Sibyl by ancient Norman common law. When a property was sold, she was entitled to one-thirteenth of the purchase price, called a la troisieme. For every chimney, she was entitled to a tax paid in chickens. For every harvest, she was owed a tenth sheaf of corn, apples, flax, hemp, or beans. She claimed ownership of every bit of flotsam and jetsam that washed ashore. Only she could keep pigeons or an unspayed dog. (Dame Sibyl’s was named Maxine.) She also had to pay the Queen for the privilege of running the island. But since the figure was never adjusted for inflation after being set in the 16th century, the cost to rule Sark was just £1.79. The islanders were also subjected to a buffet of centuries-old common laws. There was, of course, the rule on muskets. Divorce was illegal. Government officials were required to juggle multiple jobs (with the constable running double-duty as the island's chief beetle inspector). Tenants were required to spend two unpaid days a year repairing the island's roads. Most amusingly, if an islander ever felt that he or she was wronged by a neighbor, they could drop to their knees and recite the Clameur de Haro, an ancient injunction that involves yelling, “Haro! Haro! Haro! À l'aide, mon Prince, on me fait tort!” followed by the Lord’s Prayer in French. Legally, the offender had to report to the constable. To say the least, Sark’s residents have never been keen about outsiders barging in and trying to change their way of life. One time during Dame Sibyl’s reign, the island hired a new doctor who brought a car, insisting it was vital for medical emergencies. Islanders and the Chief Pleas treated the offense with the kind of hellfire one might expect of a murder trial. They determined that the car could stay—but only if it were drawn by a horse. The Dame’s complete control over the happenings in Sark wasn’t her only power over the Germans. Her name was in the Almanach de Gotha, a German directory that listed all of Europe’s most important royals and nobility—a who’s who of the continent’s aristocrats. From her opening interaction, Dame Sibyl immediately realized that any fantasies about armed insurrection would be useless. Rather, her greatest weapon would be decorum. For the rest of the war, she put on an air of exceedingly stuffy social graces. She would never approach a German, but expect him to approach her. Before allowing a Nazi to take a seat in her home, she reportedly demanded that he bow and kiss her hand. As she’d later write in The Dame of Sark, “The stiff German formality worked in my favor because it showed the Germans that I expected to be treated in my home with the rigid etiquette to which they were accustomed in their own country.” These social conventions successfully eroded her new visitors’ confidence and gave her the upper hand when they began mulling policies that threatened her people’s lives. Dame Sibyl knew that, in aristocratic circles, the artifice of polite conversation meant everything—and her words could work like a psychological water torture experiment. Each little statement was harmless alone, but over the course of weeks and months, these constant drops of rhetorical acid helped her assert dominance and compelled many German officers to drop their guard. As she'd write, “In the course of polite conversation I was often able to acquire useful information which would not otherwise have been available." Sark's residents followed the Dame's lead. When the Germans tried to implement a bureaucracy that threatened the island's feudal self-sufficiency—demanding that fishermen only go out to sea from 10 a.m. to 3 p.m., accompanied by an armed guard—they responded with their own subtle shows of disrespect. Sometimes fishermen "forgot" to appear at the docks during the approved fishing times, leaving their German chaperones waiting alone at the harbor. Other times, fishermen deliberately steered into giant swells, soaking the landlubbing Nazis and making them seasick. Even the children played tricks, stringing invisible wires across the road to trip Germans riding bicycles. But war, of course, is more than a game of pranks. All of Sark’s radios would eventually be confiscated, leaving most residents clueless as to what was happening off the island. Dame Sibyl, for instance, had a hazy idea that the Luftwaffe were bombing London, but she didn’t know about the bombings in Bristol, Birmingham, or Belfast. She also didn’t know that her eldest son, Buster, was long dead—killed during the blitz of Liverpool. By summer 1941, as more enemy troops moved onto the Channel Islands, the Germans started hoarding a disproportionate amount of the island’s produce. Sark's islanders began to suffer. The Sarkese began making “tobacco” from dried clover and fruit leaves; “tea” with dried peapods steeped in hot water; “coffee” with grated barley, dried sugar beet, and parsnips. Every meal included lobster. “When lobster is the main dish day after day, month in month out, let me assure you that you become heartily sick of the sight of it,” Dame Sibyl wrote. “If the lower classes made any attempt to bully me or my people I knew full well that neither they nor I would show any sign of cringing,” she wrote. She was able to end a handful of disputes by simply asking: Who is your superior? “Because the social conventions were so strong, she was treated with much more deference than we would get treated with now,” Seigneur Beaumont says. Weaponizing etiquette truly had its charms. When von Schmettow’s son died on the Russian front, Dame Sibyl sent him a sympathy card, a gesture Von Schmettow never forgot. So later, when Sark risked being slapped with steeper rations, von Schmettow fought the cuts on the Dame’s behalf. And when Sark’s German doctor was murdered by a fellow German soldier, the Dame’s relationship with Prince Oettingen ensured that the island received a replacement immediately. “She essentially used social protocol to broker deals,” Beaumont says. Some policies, however, were beyond Dame Sibyl’s control. "Natural factors limit the number of people who can live on Sark," Beaumont says. "If we've got close to 1000 people here, we could start running out of water." In October 1941, 300 German soldiers were sent to the island, putting a significant strain on the island's resources. Things got worse as the war heated up. The following year, British commandos raided Sark, killing two German officers and taking one prisoner. The Germans retaliated, placing barbed wire around Sark’s perimeter and laying more than 13,000 landmines, which made it impossible for the islanders to launch their fishing boats, collect the gorse they needed for fuel, or gather seaweed they used for fertilizing fields. Soon, rabbits discovered that the minefields were a great place to breed—and the island's crops were decimated by the ensuing bunny boom. Then Germany decided to deport all of Sark’s British citizens. According to some accounts, Dame Sibyl convinced the Germans that most of Sark’s people were, in fact, not British, but Channel Islanders. This little game of semantics appears to have worked: Of the 400 islanders, the list of deportees was reduced to just 11 people. It's difficult to quantify how well Dame Sibyl's networking had helped in reducing the number of deportations. We do know, however, that Prince Oettingen, who considered the Dame a friend, was so outspoken in his opposition to the deportations that he was eventually removed from his post. Now alone, Dame Sibyl doubled down on her attempts to make the occupiers feel like incompetent fools. One of the most amusing stories occurred during the spring of 1943. At the time, Sark’s Guernsey cattle were still producing half a pint of milk per head, which the island’s farmers secretly skimmed before handing over to the Germans. When the Germans complained to Dame Sibyl that they couldn't make butter with the milk, she showed up to their headquarters dressed in traditional butter-churning overalls and proceeded to give such a confusing and patronizing lecture on the art of butter-making that they were too embarrassed to ever complain again. For the rest of the war, the Germans were left scratching their heads in bewilderment as they tried making butter from skim milk. In the early morning hours of June 6, 1944, Dame Sibyl groggily woke to the rumble of bombers flying overhead and the thundering of heavy guns off the French coast. Later that morning, as she drank a cup of what could euphemistically be called coffee, the island’s German doctor visited and, in hushed tones, told her that the Allies had invaded Normandy. All the ships and planes had bypassed the Channel Islands. As Allied troops pressed into France, island life turned bleak. Winston Churchill refused to send any food to the Channel Islands, insisting that Germany was responsible for providing sustenance to lands it occupied. But the Germans didn’t provide for the people of Sark—the people of Sark provided for the Germans. Feudalism, the Dame learned, didn't work smoothly when hundreds of moochers were hoarding all the provisions. Indeed, by winter, even the Germans were feeling pinched. Chickens, pigs, cats, and dogs started disappearing. The Germans demanded that all of Sark’s stored grain, plus 90 percent of all potatoes, be funneled into their coffers. For the Dame, this crossed a line. Instead of complying, she helped launch a clandestine operation to steal back what was, according to feudal law, rightfully hers. One evening, as the Germans were preoccupied with their dinner, the Dame and a crew of conspirators stole a half-ton of wheat from the village hall, which they hid in her barn. Meanwhile, they secretly hoarded potatoes under a trap door in her drawing room. The loot was secretly distributed in to residents in rations. The months crawled until Hitler finally died. On May 8, 1945, the commanding Germans demanded that Dame Sibyl hand over Sark’s cattle and 200 tons of timber for fuel. Instead, she flew the British and American flags from her tower and joined the islanders as they lit a bonfire in celebration. By this point, there were 275 German soldiers stationed on Sark, but after the arrival—and departure—of the British liberation team, Dame Sibyl had become their commander. As she began giving orders, a British officer observed that she acted, "more forceful than any army officer and more than equal to any German Kommandant." First, the Dame demanded they establish a telephone line connecting her house to Guernsey. Then she ordered the Germans to return all the confiscated wireless radios and to remove all 13,500 landmines. She insisted that each prisoner repeat her commands and relished hearing the soldiers say: “Zu Befehl, Gnädige Frau”—"At your command, madam." Over the coming months, German POWs completed a series of construction projects, building a protected concrete path over a narrow isthmus connecting the southern half of the island; repairing and redecorating the homes they had occupied; and resurfacing the island’s roads. They also removed rusty roll-bombs dangling from wires over Sark’s harbors. One day, Dame Sibyl received a call from Sark’s ex-Kommandant informing her that one of those bombs had exploded. Two German prisoners were killed. In that moment, the courtly facade of manners the Dame had maintained so firmly for five years finally crumbled. She said what was exactly on her mind. For much of the war, Sark’s people resented Dame Sibyl for asking them to stay. That changed when they learned about the neighboring island of Alderney. Similar to Sark in size and culture, Alderney was completely evacuated days after the bombing of Guernsey—and the Nazis went on to destroy it. They dismantled Alderney’s homes for firewood. They constructed ugly concrete fortifications, bunkers, air raid shelters, and gun emplacements and built two work camps and two concentration camps. They killed the last Alderney cow, rendering the unique breed—which only lived on the island—extinct. The occupation had a similar effect on the island’s unique dialect, Auregnais: The displacement of Alderney’s people killed the language. After the war, Alderney was rebuilt from scratch, and most returning residents abandoned any relics of old Norman politics. Today, Alderney has recovered—but it is relatively dense with cars and homes. (Despite being the same size as Sark, it’s home to five times as many people.) The island is still beautiful, but the old-world culture and atmosphere that made it unique has disappeared. Had Sark’s people left, the island may have suffered a similar fate. That’s not to say Sark hasn't changed. Today, the chimney tax is gone. (Dame Sibyl got annoyed when islanders began paying with their wimpiest chickens.) Few, if any, of the old grain-based tithes are collected, and the island’s agricultural industry has dwindled to favor tourism. The stringent rules on divorce have been modernized and the island’s language, Serquais, is down to its last five speakers. Most drastically, in 2008, Sark’s feudal politics was abolished in favor of democracy, a decision that stripped the landowning class—and all future seigneurs and dames—of their power. The feudal system of land tenure, however, remains intact. There is still no freehold on Sark, which ensures that the 40 tenements retain their quaint, rural charm. The seigneur, who occupies a more ceremonial role, remains the island’s chief tenant, with perpetual fief owed to the Queen. (The method of payment, however, has been modernized; today, Seigneur Christopher Beaumont—Dame Sibyl’s great grandson—pays Queen Elizabeth II £1.79 through an online bank transfer.) And some of the old Norman laws are still enforced: The Seigneur still owns all of the island’s pigeons. Whatever charm Sark has retained, much of it is owed to Dame Sibyl. Every deported islander would survive the war, and nearly all of them would return to Sark, where the Dame's steadfast leadership brought the island back to its old routines. The return of normalcy could be seen most clearly through the prism of local politics, where, once again, the quaintest moves to modernize were treated with unbridled hysteria. Take when an aging Dame Sibyl, battling arthritis and a bum hip, decided to bring an electric mobility scooter onto Sark. It might as well have been Watergate.